As well as space, the new XFs interior ambience is enriched by crafted, luxurious materials, sophisticated instruments and calm interior mood lighting. Engineering excellence and attention to detail mean the XFs interior matches the best-in-class for refinement, while Jaguars intelligent use of technology and driver-friendly Touch-screen controls add new layers of comfort and ease of use. Every XF model has shift-by-wire transmission control, with Jaguars class-leading sequential shift system  its popularity already confirmed by feedback from XK sports car customers  used for the first time in a saloon. Shift-by-wire replaces manual shift linkages with electronic commands and gives every XF rapid and very smooth gearshifts  faster, even, than the acclaimed XKs transmission. But the most exciting feature of the XFs transmission control is the all-new JaguarDrive Selector TM  an industry-first rotary shift interface that combines precise, intuitive control with space-saving packaging, to allow maximisation of interior storage options. Other innovative functional features add more surprise and delight. Air-conditioning vents present a flush dashboard surface until the ignition is switched on, at which point they elegantly rotate to the open position. Another new technology - JaguarSense TM - introduces touch or proximity-sensing control for overhead console lights and the glovebox release. Every level of audio system features at least eight speakers, with a premium system designed in association with highly respected audio specialist Bowers & Wilkins available on range-topping models. Radio options now include a Digital Audio Broadcasting (DAB) system and Sirius Satellite Radio for the North American market, while the XF technology count includes Bluetooth® communications technology, plus optional iPod ® and MP3 player connectivity with full-function control through the Touch-screen  and an auxiliary port on every car for other portable audio devices. * The XF is a four-door Jaguar that fuses the style and performance of a sports car with the refinement, space and sophistication of a luxury saloon. * The exterior styling of the XF is the first expression of Jaguar's new design language in a saloon car. With interior design that is the equal of the exterior in terms of crafted execution and visual excitement, the XF offers a truly contemporary, luxury environment. * The coupe-like lines of the XF belie the amount of space inside: there is room for five adults in comfort, generous interior stowage and a boot capacity of up to 540 litres * (plus the opportunity to fold the rear seats and add a further 420 litres). * Jaguar craftsmanship adopts a sharp new edge on the XF. Sophisticated instrumentation, a Touch-screen, modern materials and graphics complement new surprise and delight features. On entry to the XF, the start button pulses red, like a heartbeat. Start the engine and the JaguarDrive Selector TM rises into the palm of the hand, while rotating vents turn from their flush, 'parked' position to their functional open position. * The best torsional stiffness in class delivers both refinement and dynamic performance  underpinning the driver-focussed yet remarkably comfortable driving experience. * Key driving aids on the XF include Electronic Brake Assist, Electronic Brakeforce Distribution, Anti-lock Braking System, Dynamic Stability Control, Cornering Brake Control, and Engine Drag Torque Control. And, for the first time in a Jaguar, Understeer Control Logic which decelerates the car and helps to restore grip to the front wheels when required. * The new XF has a wide portfolio of driver assistance features including a Blind Spot Monitor, Front and Rear Parking Aids, Rear Camera Parking Aid, Adaptive Cruise Control, Automatic Speed Limiter and Tyre Pressure Monitoring System. Bluetooth® compatibility, iPod®/MP3 player interfaces, JaguarVoice TM, Digital radio and a single or six-disc CD player ensure owners can listen and talk as they choose. * XF offers three levels of audio system, all controlled through the Touch-screen. The top-of-the-range Bowers & Wilkins 440w Premium Sound System option offers extraordinary clarity and faithful sound reproduction. Designed and tuned for the XF by Bowers & Wilkins, the surround-sound system delivers a powerful and vivid performance. * In a first for a Jaguar saloon, the XF has the marques new Pedestrian Contact Sensing System. This can mitigate pedestrian injury by firing actuators that deploy the bonnet, resulting in a cushioned space between the bonnet and engine hardpoints. * Three trim levels will be offered, depending on market. The Luxury level will be available with either petrol or diesel V6 engines (and naturally aspirated V8 models in the US), Premium Luxury (with petrol or diesel V6, or naturally aspirated V8), and SV8 (with the supercharged V8 petrol). * The XF is available to order now, depending on market. The first cars will be delivered to customers in March 2008. Pricing is available from individual markets depending on the start of customer orders. All performance figures are manufacturers estimates. The defining element of the new XF as a true sporting Jaguar is its visual strength. Driven by a bold new design language, the XF firmly emphasises contemporary and emotional themes while remaining unmistakeably a Jaguar. Targeting leadership in exterior and interior design, the XF builds on already high standards of craftsmanship, quality and dynamic refinement, while improving packaging and aerodynamics even further. The new XF enters the range in the niche previously occupied by much-loved mid-sized Jaguar saloons such as the original XJ Series 1 (a car that was smaller than todays XJ). But unlike many D/E segment premium saloons, the new XF pushes boundaries away from the three box style and creates a four-door, five-seat saloon with strong, coupe-like lines. Jaguars new design language, which debuted with the new XK sports car, is applied to a saloon car for the first time in XF. The visual step forwards is as significant as it is obvious - the XFs proportions, for example, are so closely matched to those of the XK that the screen rake angles are the same on both cars. Having the space and practicality of full five-seat accommodation was a programme imperative, so the XF is proportioned to provide interior space and levels of comfort that challenge for best-in-class honours. At 4961mm long and 1877mm wide, on a lengthy 2909mm wheelbase, the XF is 45mm longer and 25mm wider than its nearest 'dimensional' competitor, the Audi A6  with even greater advantages over the BMW 5-Series, Lexus GS300 and Mercedes-Benz E-Class. The XFs visual emphasis is sporty, muscular and dynamic  a character defined by a sweeping silhouette inspired by the XK, a powerful grille, dramatic side window graphics and, of course, strong Jaguar shoulders. The look, however, does not come at the expense of efficient packaging. The XFs waistline rises to meet the roof rather than the roof coming down to meet the waist, which improves interior space. This rising waistline gives the XF a higher tail than any previous Jaguar, providing the twin benefits of much improved aerodynamic performance, together with substantially increased luggage volume. At a maximum of 540 litres (500 with a spare wheel) the XFs boot is the equal of anything in the class and betters most rivals. The XFs Jaguar character is defined by its face  centred around a bold intake grille which provides a focal point for the feature lines which stream back over the bonnet and cabin, it has inherent visual strength. The grilles mesh pattern is itself an important element of external jewellery, the woven pattern an emotional design signature that is quintessentially British, with strong sporting connotations. The headlamps further emphasise the way in which Jaguars design language has progressed. The one-piece clusters have a wide aspect ratio and wrap around the corners of the body onto the front wings. Closer inspection of the headlamp internals reveals twin round elements incorporated within the overall shape; a subliminal reminder of the Jaguar saloon quad lamp signature. The front lower bumper includes powerful air intakes, carrying chrome 'splitter' blades whose simple, modern lines evoke the technical, strongly engineered shape of a propeller blade. In profile, the new XF follows the Jaguar credo of having flowing, uninterrupted lines. The feature line that starts at the outboard edge of the lower air intake, runs up over the front wing, rises into the waistline and then runs around the trailing edge of the bootlid is an example of this. The stance of the XF is new for a modern-day Jaguar saloon. It gives the car a ready to pounce look that suggests latent power and energy, the strong wedge profile of the waistline imparting a forward-biased dynamic before the car has even turned a wheel. The XFs wide rear track not only enhances the handling and dynamic values of the car but also reinforces the visual confidence of the new shape. At the rear, the design elements integrate to emphasise the width of the car. The bright signature blade, which proudly carries the JAGUAR script, appears to extend beyond the boot lid and into the tail lamps by aligning it with the clear windows of the reverse/indicator clusters. The tail lamp graphics wrap around onto the rear wings, leading your eye out to the broad, muscular rear wheel arches. The lamps use state-of-the-art LED technology to give the XF an unmistakeable night-time signature and an exotic personality. The wheels lie at the extremities of the body, with the wings sculpted to make them look like powerful, bulging muscles. Every wheel and tyre combination has been engineered to have the same rolling radius, giving a consistent wheel to body visual relationship. The XF is fitted with either 17, 18, 19 or 20-inch alloy wheels, the supercharged SV8 being the only car in its class to have 20-inch wheels as standard. The exterior details of the XF have been designed as if they are finely crafted items of exquisite jewellery. The distinctive bright aluminium finisher around the side window, for example, is unusual in being a single-piece pressing and is an unmatched piece of craftsmanship. The side power vents have the Jaguar name embossed on an ingot bar across the centre, while the venturi shape below the tail  which hints at the XFs sophisticated aerodynamics  is positioned above large, stylised twin chrome tailpipes. The XF is unmistakably a Jaguar and its badging unequivocally identifies it as such: a large growler badge is prominent on the front grille, while adding the Jaguar leaper to the rear boot lid is an emotional statement - a powerful signature that customers associate strongly with the most sporting Jaguars. From launch, the XF offers three trim levels: Luxury, Premium Luxury and SV8. Externally, with the exception of wheel styles and a badge on the SV8, all cars will look the same  a customer is buying an XF, rather than an XF in a particular trim level. As well as facilitating packaging excellence, the XFs new design language has another significant functional advantage: for the first time on any Jaguar, the entire body was developed using Computational Fluid Dynamics (CFD) before the car ever saw a wind tunnel. Every area from the outer skin to the lightweight, composite undertray to the cooling airflow (even the shape of the exterior mirrors) was optimised using this process. The higher, squarer tail is more efficient aerodynamically than a lower, rounded one, and the XFs coupe-like roofline and subtle, raised bootlid lip improve airflow over the rear of the car. As a result, the XF has the best aerodynamic performance, in terms of drag, of any production Jaguar ever and is better than the race-bred, limited edition XJ220 supercar. The XFs drag coefficient is just 0.29 and the front-to-rear lift balance is precisely zero. This aerodynamic performance contributes to impressively low wind noise, aids fuel consumption and strong high-speed stability and, of course, is vital in ensuring ideal handling balance through optimising drag and lift forces. Relax inside the XF and you are in a very special place indeed. There is space  more than many will imagine given the XF's sports saloon design  but also the sense of being in a perfectly proportioned, agile car. There is also comfort  of course  but it is the c raftsmanship, materials and attention to detail that impress. Consider, too, the generous equipment specification  the features that empower rather than overpower the driver  and the strengths of the XF are readily apparent. The interior design maximises the feeling of space, with driver and passenger seating positions, the relationship of seats to window areas, and the volume and versatility of stowage options all contributing. New thinking on seat design  the front seats are deliberately sculpted and reduced in size (but not comfort)  liberates space and makes access easier, too. The increased track and best-in-class rear seat width means tall adults can sit in complete comfort. And while the XF roofline might say coupe, the rear headroom says saloon better than many rivals. Just as the XFs exterior defines a new design direction, its interior moves from traditional themes to contemporary, sporting luxury - emphasised by surprise and delight features such as the JaguarDrive Selector TM and the rotating vents; through the use of sophisticated new materials; and by all-new graphics and interior lighting systems. The line defined by the soft-trimmed dashboard top and aluminium finisher runs continuously through the front and rear doors, making the interior feel more spacious, and especially making it seem wider from the front seats. Real wood  more than in any Jaguar since the iconic MkII saloon in the 1960s  underlines what is a luxurious interior, with veneers including Satin American Walnut, Burr Walnut and a very modern, straight-grained Rich Oak that works particularly well with textured aluminium highlights that are used in every XF to enhance the contemporary, technical feel. And true to Jaguars core values of authenticity of materials, what looks like wood really is wood. Even the XFs headlining material is a step on from conventional materials. Using a modern technical weave called Morzine, the entire cabin roof and A-pillars are trimmed in this eye-catching, contemporary finish. In the XF, many features are invisible until needed - a different approach from carmakers who push technology as a dominant interior theme. The rotating vents revolve out of sight when they are not in use; the Touch-screen controls many features, allowing mechanical buttons to be reduced to a discreet panel below the navigation screen. Jaguar design is about reducing clutter; the switches that are there primarily give quick and easy access to functions such as audio volume and climate control temperature. As well as the centre cubby, which includes CD storage, an auxiliary power supply and a Portable Audio Interface for an iPod® or other MP3 player (depending on market), the centre console has two compartments with veneered lids. It can take a 44-ounce big-gulp cup and two more modestly sized cups plus other oddments. Without the cupholders in place there is generous oddment storage space for items such as sunglasses in their cases. There are large storage pockets in each door and on the backs of the front seats, while the rear centre armrest also incorporates two cupholders. But it is not only in the storage of everyday items that the XF excels  the minimum capacity of the boot is more than 500 litres, with the possibility to add even more storage space depending on factors such as whether the space-saver spare wheel or Jaguar Tyre Repair System is fitted. At its maximum 540 litres, the XFs boot is equal to the best in class  and there is still the option to liberate a further 420 litres of space by folding down the rear seat backs. One feature that maximises space efficiency is the JaguarDrive Selector TM, an unobtrusive yet completely practical solution to selecting an automatic gear mode. But the Selector does much more than this thanks to a start-up sequence that is a strong driver 'handshake' ­ and a real statement of the XFs individuality. Get into an XF and the start button in front of the JaguarDrive Selector TM pulses red, like a heartbeat. Press this button to start the engine and the cast alloy JaguarDrive Selector TM rises into the palm of your hand. Simultaneously, the navigation system initialises to its home page and the rotating vents turn from their flush, 'parked' position to their functional open position. While the vents are open, they offer vertical and horizontal directional vane adjustment and full airflow adjustment down to zero. With the JaguarDrive Selector TM, automatic transmission functions are selected simply by turning the control with the fingertips. As an example, Drive to Drive Sport selection is accomplished with a simple push and turn action. Returning from S to D, the rotary control operates with spring-assistance, which eliminates the need to pull the Selector. It couldnt be simpler. Phosphor blue mood or halo lighting echoes the ambience you might find in a favourite contemporary bar or restaurant. This same lighting technology is also used in MP3 players and mobile phone handsets to illuminate keypads and controls. On the XF, halo illumination around the switch panels and JaguarDrive Selector TM console, the start-stop button and Electric Parking Brake gives a soft glow that indicates their positions without distracting the driver. Mood lighting is also incorporated into the header console, bathing the centre console in a cool blue light, while lights under the front door releases softly illuminate the door-mounted switches. Soft, phosphor blue illumination is also used on the instrument dials, highlighting the sporting feel of the aluminium-coloured dials. As well as being soothing, blue does not conflict with any of the green, yellow or red alert or warning signals on the car. Following the luxury theme, there are chrome highlights on the column stalks and the moulded halo material around the JaguarDrive Selector TM and audio/climate switch-pack appears as a soft, almost smoky, chrome until illuminated. The main switches have been designed to give the feel of a high-quality audio system, incorporating short travel with positive feedback to the user. This design is then used in the minor switchpacks in the overhead console and the auxiliary pack outboard of the steering wheel. Electric window switches are illuminated through a jewel-like design that diffuses a soft phosphor blue glow around the switch. All switches and buttons have the same Tungsten finish to emphasise harmony and sophistication in the interior. To say that luxury comes as standard on the XF is an understatement. Front seats are electrically adjustable, with a minimum of eight-way seat adjustment for the driver and front passenger, while the SV8 offers 16-way drivers seat and 12-way passengers seat adjustment with 4-way power lumbar and cushion length adjustment for the driver. The new XF also introduces the option of active heated and cooled ventilated front seats, with fan-assisted whole seat heating, whole seat cooling, or just squab heating or cooling. And because the XF cleverly separates seat and cabin temperature controls, it gives the option of a warm cabin with a cool seat, or vice versa. And all of this with a new climate control system that is also the most efficient Jaguar has ever offered. Attention to detail was a mantra throughout the XFs development. The three trim levels offer combinations of Bond Grain leather and Softgrain leather in a subtle colour palette. The Luxury trim level uses non-perforated Bond Grain leather for the seat facings with matching material for the twin needle stitched facia and door top rolls. Premium Luxury and SV8 have a sumptuous interior with Softgrain leather used throughout for seats, facia and door top rolls, while perforated Softgrain leather is used on the seat facings to facilitate the fan-assisted heating/cooling feature. The XF is exceptionally well equipped. Bluetooth® technology allows mobile handsets with Bluetooth® capability to communicate with the cars in-built telephone system and phone calls can be controlled either via the Touch-screen or hands-free, using the steering wheel controls or JaguarVoice TM control. The XF offers three levels of audio system, again all controlled through the Touch-screen. The eight-speaker Jaguar Sound System has a woofer and tweeter unit in each door  the woofer being mounted much higher than conventional systems to ensure good bass reproduction . The Jaguar 320W Premium Sound System has a DSP amplifier linked to nine speakers: eight premium door-mounted and (through clever packaging of the boot area) a 32-litre sub-woofer for enhanced bass. The Bowers & Wilkins 440W Surround Sound System has a remote amplifier with Dolby® Pro-Logic® II 7.1 Surround Sound and 14 speakers . Bowers & Wilkins technology, exclusively used in Jaguar cars, is acclaimed by audiophiles, artists and recording engineers alike. Kevlar cones in the larger speakers (the distinctive yellow appearance is discretely visible through the speaker grille) improve linearity of response and reduce distortion, while aluminium domes on the tweeters improve sound reproduction at high frequencies by reducing the weight of the moving part. XF customers can import their own portable media player to interface with the car - including iPod® and other portable audio players, or USB storage devices such as memory sticks. In a world first, full Touch-screen control of the iPod® allows access to Playlists and Music search by Artist, Album or Genre. USB Mass Storage devices may also be accessed via the Touch-screen and other players can be connected to the car through the standard fit Auxiliary Input port. The XF audio system also offers Digital Audio Broadcasting (DAB) and in North America, Sirius Satellite Radio. Sirius is growing in popularity because of its commercial-free output and because the same network is available coast to coast, north to south. XF owners also have the option of analogue/digital TV reception, with up to nine analogue and nine digital channel pre-sets with full function control, including country or format selection and one-touch channel-search, all through the Touch-screen menus. JaguarSense TM - an electronic control system that gives touch or proximity operation to open the glovebox lid and to control the overhead console lights  is another XF (and industry) first and removes the need to locate a small switch, especially useful in the dark. JaguarVoice TM, meanwhile, offers the driver the option of voice control for functions including audio, CD and TV, satellite navigation, telephone, climate control, and display and memory functions. The XF also uses new technology to make driving safer and more relaxing, with the choice of traditional cruise control or Jaguars Adaptive Cruise Control. In tandem with normal cruise control, an Automatic Speed Limiter that allows the driver to select a maximum speed that should not be exceeded, makes life easier and safer. A new optional Blind Spot Monitor system remotely covers areas that still cant be seen either directly or by mirror, with a radar (rather than camera-based) blind spot monitoring system. The XF has a Rear Parking Aid as standard and a Front Parking Aid as an option  and for the first time on any Jaguar, a Rear Camera Parking Aid offers a system that combines a rear-facing digital video camera with the Touch-screen information centre. Virtual Process (VP) and Virtual Series (VS) are the cutting-edge technologies used by Jaguar to take the XF from concept to reality. These techniques use massive computing power and sophisticated modelling programmes to create components and even whole vehicles in the virtual world, before building physical parts and perfecting the systems and processes to manufacture the car. The XF represents the first time that VP and VS tools have been used by Jaguar throughout a complete vehicle programme - from vehicle development, to production feasibility studies, to build planning. But VP also dramatically improves overall quality, by allowing rapid sign-off of component designs, and eliminating the early physical prototype stage. With VP, when prototypes finally are built, they are intended only to validate what is already known, not to develop areas that are still unresolved. Fully representative vehicles are used for physical evaluation, including on-road testing, crash-testing, hot and cold climate testing, and durability testing. At the same time, the VS programme is working on everything that is needed eventually to build the car  leading to significant improvements in craftsmanship, efficiency, even long-term serviceability. New technology is also key to the XFs construction. It was the first programme within Jaguar to use the next-generation CAD programme C3PMG, which combines an all-new CAD-modelling software package with an all-new data-management package  opening the way to exceptional strength without unwanted weight. The design is led by safety needs, especially by the latest side intrusion and SUV over-ride requirements. The reinforced passenger safety cell incorporates new thinking from the lower side rails up. The XF adopts the latest generation steels, especially in the upper body  including high carbon steels, dual-phase, hot-formed boron steels, and bake-hardened steels to form a vertical safety ring around the occupant cell. As well as combining strength with lightness, these steels improve corrosion resistance, by making best use of zinc and improving e-coat paint flow  and new thinking means that in spite of their strength, the XFs A and B-pillars are impressively slim, to the benefit of both visibility and accessibility. Similarly, the lower sills are the first component on any Jaguar to use incredibly strong, dual-phase DP600 steel. Second-generation Pedestrian Contact Sensing System  the acclaimed safety system introduced by Jaguar on the XK  is included on the XF (market dependent). This can mitigate pedestrian injury by firing actuators that deploy the bonnet, resulting in a cushioned space between the bonnet and engine hardpoints. 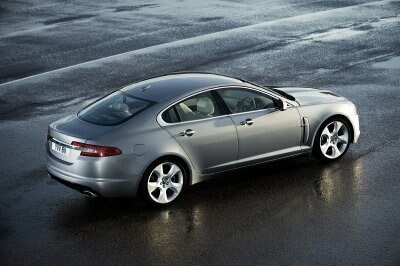 The system builds on the technology proven in the XK, using higher resolution sensing and an active rear-hinged bonnet. Every XF also comes with two-stage driver and front passenger airbags, side and curtain airbags and seat occupant sensing systems to help ensure the airbags work precisely and only as needed in every circumstance. Front-seat occupants also have the added protection of an anti-whiplash system and soft-landing technology in the seat-belt retractors to soften contact with the front airbags. Other changes - many of them made possible by extensive use of the Virtual Process during the development programme - improve craftsmanship by optimising the manufacturing process. Close attention to optical quality creates the smallest, most consistent panel gaps and other new measures improve resistance to minor impacts, making accident repairs easier and less expensive, so contributing to significant cost-of-ownership benefits. The XFs class-leading torsional rigidity has significant benefits for refinement and provides the perfect platform for a suspension system that is a further development of the XK sports car, and delivers a ride/handling balance and steering characteristics absolutely in line with the XFs sporting looks. Unequal length wishbone front suspension with weight-saving aluminium components, and multi-link rear suspension are both subframe mounted for maximum control, including excellent straight-line stability and strong anti-dive characteristics under heavy braking, with minimum road noise and vibration. 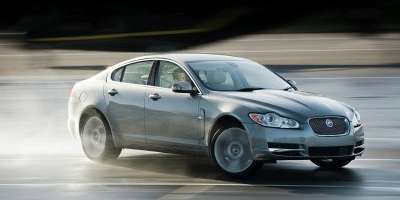 The only suspension variations on the XF are between the V6 petrol, V6 diesel and V8 naturally aspirated models, which all use finely tuned passive suspension, and the SV8, which for all markets uses Jaguars Computer Adaptive Technology Suspension (CATS TM). The latest CATS TM is a sophisticated system shared with the new Jaguar XK sports grand tourer. It uses electronically controlled, two-stage, adaptive dampers whose characteristics are automatically adjusted within milliseconds in response to road conditions and driving inputs, for the optimum balance between comfort and control. The XF uses large 326mm x 20mm vented front discs on all naturally aspirated models and 355mm x 32mm vented front discs on the SV8 model for powerful, balanced braking performance. The rear discs on all versions measure 326mm x 20mm. An extremely stiff pedal box contributes to a particularly solid pedal feel, and the brake assistance is tuned to give a very progressive feel, while softening the initial response. The XF uses Jaguars Electric Parking Brake, with a small and neat, chromed release in the centre console. As the XFs braking system communicates electronically with the shift-by-wire technology of the JaguarDrive Selector TM function, so the Parking Brake is released automatically as Drive is selected  although the Parking Brake can also be engaged and disengaged manually if appropriate. Variable ratio power-assisted steering is standard on every version of XF, for reduced parking effort at low speeds and greater precision and feedback at higher speeds - and especially for positive weight to the on-centre feel, which is part of the new dynamic flavour. Steering effort at manoeuvring speeds is also reduced on diesel models. The new XF adopts an electronic steering column lock - for compatibility with passive entry mode and the Jaguar Smart Key System TM. There is no longer a key barrel on the column, however the electronic lock satisfies Thatcham security legislation for the UK market. The XFs steering wheel includes cruise-control, JaguarVoice TM (where fitted) and audio controls - including volume, and radio channel pre-sets. The source button toggles through AM/FM/CD, plus any external device functions. The select buttons allow features such as CD track change, radio channel pre-set selection or iPod® or MP3 track change if such a device is in use. Depending on market and model, the XF is available with 17, 18, 19 or 20-inch wheels; the SV8 being the only car in its class to have 20-inch wheels as standard. All are cast in aluminium alloy and every design combines maximum strength with minimum weight. To satisfy Thatcham security stipulations, there are also 20 variations of anti-theft locking nut. All cars for the majority of markets carry the same specification of 18-inch diameter alloy mini-spare. For major European markets, cars with 17 and 18-inch wheels are fitted with the Jaguar Tyre Repair System as a space and weight-saving alternative to the mini-spare. This replaces the spare wheel, jack and tool kit, and can effect a temporary repair of any puncture of up to 6mm diameter in the tread area - sealing the hole and re-inflating the tyre to enable the car to be driven to where a permanent repair or replacement can be carried out. When fitted in lieu of a spare wheel, the Jaguar Tyre Repair System liberates an additional 40 litres of stowage space under the boot floor. The XFs main control module governs many key safety functions including Emergency Brake Assist (EBA), Electronic Brakeforce Distribution (EBD), Anti-lock Braking System (ABS), Traction Control through engine and brake intervention, Dynamic Stability Control (DSC), Cornering Brake Control (CBC) and Engine Drag Torque Control. And for the first time, the XF adds Understeer Control Logic, which has been designed to mitigate understeer by intervening through the engine management and braking systems to decelerate the car and help restore grip to the front wheels. A two-stage DSC system similar to that featured on the new XK is standard. It combines the normal on-off switchable DSC function, which reacts as soon as it detects slip, with Trac DSC, which allows more slip before intervening  better for a more sporting driving experience. It also allows a degree of wheel overspin on deep soft surfaces, which is essential for running with snow chains. The system defaults to normal DSC on with each ignition-on sequence. I n Dynamic Mode (SV8 only), pressing and holding the DSC button fully disables the system, allowing an experienced driver to exploit fully the capability of the chassis, where conditions allow. Mode selection is confirmed on the instrument cluster display. Also new on XFs fitted with Adaptive Cruise Control (ACC) is Electronic Brake Prefill. This senses any rapid throttle lift-off and initiates a small brake hydraulic pressure build-up in anticipation of the brakes being applied, to give better pedal response and slightly shorter stopping distances. JaguarDrive Control TM offers different modes that interact with the DSC system, engine and gearbox, to change the characteristics of engine mapping, transmission shifts and brake interventions depending on driving conditions and circumstances. On naturally aspirated cars JaguarDrive Control TM has Normal and Winter modes, on the SV8 model there are Normal, Winter and Dynamic modes - the last of these to allow a more purposeful driving style. Both petrol and diesel V6 engines are offered in Luxury and Premium Luxury models; the naturally aspirated V8 will be Premium Luxury only (and Luxury for US models) and the supercharged SV8 has its own unique specification, for a very logical, easily understood range with only six major variants. The Euro IV compliant twin-turbocharged 2.7-litre 24-valve V6 diesel delivers high efficiency, high performance and class-leading refinement  its headline figures including 207PS (EEC) and 435Nm (EEC) of torque. With its Compacted Graphite Iron (CGI) cylinder block and aluminium cylinder heads it is the lightest diesel engine of its type and size - making a significant contribution to the new XFs power-to-weight ratio, performance and fuel economy. The V6 diesel features the latest generation high-pressure Common Rail direct-injection, multiple pilot injection, and piezo-electric injection control, allowing sophisticated management of the injection patterns to make combustion smoother and quieter. Four valves per cylinder and advanced combustion chamber shapes contribute to high combustion efficiency with low combustion noise, alongside very low mechanical noise levels. Emissions are further reduced by using twin variable-geometry turbochargers with electronic control, exhaust gas recirculation, and a variable-swirl intake system. Using two small turbochargers, with drive-by-wire throttle control, rather than one larger unit, also gives a quicker, smoother response. The 3.0-litre V6 petrol engine is another compact, lightweight, all-aluminium design with four overhead camshafts, four valves per cylinder, VCP Continuously Variable Cam Phasing and variable geometry air intakes. It produces 240bhp (SAE)/238PS (EEC) and 221lb ft (SAE)/293Nm (EEC) peak torque - with more than 80 percent of peak torque from below 1500rpm to maximum engine speed at 6800rpm. Variable Camshaft Phasing produces faster response and performance at all engine speeds - with more torque at low speeds and maximum power at high speeds. It also provides internal exhaust gas recirculation, reducing both hydrocarbon and NOx emissions. The 4.2-litre V8 comes in naturally aspirated or supercharged versions. With a ribbed aluminium block and cylinder heads it is very light but extremely strong, and its superb structural stiffness minimises radiated engine noise and increases mechanical reliability. The V8s exhaust system has also been completely retuned to remain quiet at cruising speeds but deliver a substantially more purposeful V8 roar under hard acceleration. In naturally aspirated form it develops 300bhp (SAE)/298PS (EEC), and 310lb ft (SAE)/411Nm (EEC) of torque. The supercharged version uses a highly efficient rotor-type supercharger, belt-driven from the crankshaft. It develops 420bhp (SAE)/416PS (EEC), and 408lb ft (SAE)/560Nm (EEC) of torque from low engine speeds. Just as important as the supercharged engines peak torque is the way the usable torque is spread across a wide rev range - with at least 86 percent of the peak from 2000rpm to maximum engine speed. A superior six-speed automatic transmission  renowned as one of the best in the world and already proven in other Jaguars - is used on all versions of the new XF. There is no manual gearbox option. The transmission is a key element in the XF's sporting character, its adaptive gear-changing strategies responding both to road conditions and the way the car is being driven, giving the smoothest shifts and optimum performance. Adding another layer of driver focus, the transmission is controlled by the new JaguarDrive Selector TM with the option of manual selection through Jaguar Sequential Shift TM. The JaguarDrive Selector TM is also used to access the XFs Sport mode which uses shift-by-wire technology pioneered on the XK. These high-tech, modern powertrains give every XF model outstanding performance. The 2.7-litre V6 diesel reaches 60mph in just 7.7 seconds (0-100kph in 8.2 seconds) and has a top speed of 143mph (229kph). The 3.0-litre V6 petrol version sprints to 60mph in 7.9 seconds (0-100kph in 8.3 seconds) and goes on to reach 148mph (237kph). The naturally-aspirated V8 model has a superb 0-60mph time of just 6.2 seconds (0-100kph in 6.5 seconds) and has an electronically limited top speed of 155mph (250kph). Lastly, the supercharged SV8 XF storms to 60mph in just 5.1 seconds (0-100kph in 5.4 seconds) and, like the naturally aspirated V8, is limited to a maximum of 155mph (250kph). Delivering the highest levels of driver enjoyment is a must for any Jaguar, so it is essential that the XFs driving dynamics live up to its powerfully athletic looks. Underpinned by the stiff platform, wide track and finely resolved suspension, steering and brakes, the XFs dynamic flavour combines the comfort and refinement of a luxury saloon with the grip, balance, responses and stability of a sports car. The result is a dynamic character that delivers real driver involvement, as far removed from the premium saloon crowd as are the XFs bold looks. Every XF model uses Jaguar Sequential Shift TM transmission control, allowing manual gear selections in the automatic transmission via paddle switches mounted on the rear of the steering wheel, in either Drive or Sport mode. But sporty is only half the XF driving dynamics story  refinement is equally important, and equally impressive. With its stiff shell, smooth powertrains and extraordinary attention to acoustic management (including a secondary bulkhead and dual-isolated subframe on all versions), the XF has outstanding NVH performance to match the best in class. At 30mph (50kph), for instance, the interior noise level is only 65.6dB, below its nearest BMW 5-Series rival, even when the XF is on larger wheels. Special attention has been paid to the V6 diesel, whose sound quality is so impressive it is hard to tell which engine lies beneath the bonnet. The V8 XF takes lessons from the XK with an exhaust system tuned for an overtly sporty sound quality, especially when accelerating hard  again, just as the looks promise. The new XF is a milestone for Jaguar. In every respect it signals the future of the marque  and yet it remains true to the essence of what has always made great Jaguars the cars they are. And XF buyers can look forward to enjoying continued fiscal benefit. Anticipated strong residual values will appeal to those using the XF as a business car, while the V6 diesel in particular has competitive emissions levels, with the accompanying tax advantages for company car users and fleet buyers. As one of the most visually striking, technically sophisticated and driver-oriented saloon cars that the company has ever produced, the XF is synonymous with the forward-looking focus that now defines the Jaguar brand. Its design language is entirely new, its performance and dynamic flavour support  even eclipse - its sporting looks, and intelligent use of advanced technology and innovative control interfaces set the XF far apart from any other premium sports saloon. This is the future, now.